Grand Forks ND: Ryan Flaten ran away with the feature in the Street Stock feature at River Cities Speedway on the opening night at River Cities Speedway. 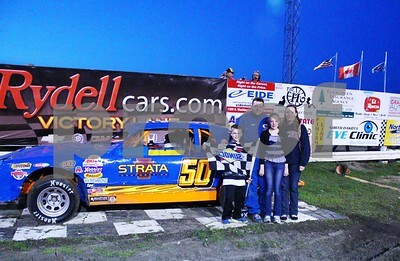 Ryan in his#50 Strata Corp sponsored Street Stock ran 1 mile per hour faster than all other competitors in the field. Ryan Flaten and his family posing in RydellCars.com Victory Lane at River Cities Speedway. 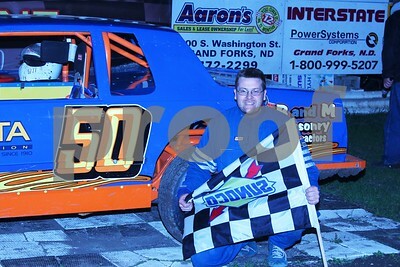 #50 Ryan Flaten Street Stock Driver Celebrating his win in RydellCars.com Victory Lane. The fastest Street Stock lap time of the night was set on lap 2 of hot laps by Ryan Flaten at 15.285 seconds and a top speed of 70.658 miles per hour which was also the fastest of the night in the Street Stock Class. Click here for more results.